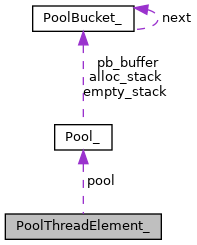 Consumers of this API MUST add PoolThreadReserved as the first member in the data structure. They also MUST ignore that data completely. It's managed by this API. It's purpose is to make sure thread X can return data to a pool from thread Y. Definition at line 42 of file util-pool-thread.h. Definition at line 43 of file util-pool-thread.h. Definition at line 44 of file util-pool-thread.h.